The role of vitamin D in innate immunity is increasingly recognized. Recent work has identified a number of tissues that express the enzyme 1α-hydroxylase and are able to activate vitamin D. This locally produced vitamin D is believed to have important immunomodulatory effects. In this paper, we show that primary lung epithelial cells express high baseline levels of activating 1α-hydroxylase and low levels of inactivating 24-hydroxylase. The result of this enzyme expression is that airway epithelial cells constitutively convert inactive 25-dihydroxyvitamin D3 to the active 1,25-dihydroxyvitamin D3. Active vitamin D that is generated by lung epithelium leads to increased expression of vitamin D-regulated genes with important innate immune functions. These include the cathelicidin antimicrobial peptide gene and the TLR coreceptor CD14. dsRNA increases the expression of 1α-hydroxylase, augments the production of active vitamin D, and synergizes with vitamin D to increase expression of cathelicidin. In contrast to induction of the antimicrobial peptide, vitamin D attenuates dsRNA-induced expression of the NF-κB-driven gene IL-8. We conclude that primary epithelial cells generate active vitamin D, which then influences the expression of vitamin D-driven genes that play a major role in host defense. Furthermore, the presence of vitamin D alters induction of antimicrobial peptides and inflammatory cytokines in response to viruses. These observations suggest a novel mechanism by which local conversion of inactive to active vitamin D alters immune function in the lung. Vitamin D is a steroid hormone that plays a key role in regulation of innate immunity. Most tissues express the vitamin D receptor (1), permitting a response to the hormone. Humans obtain vitamin D precursors from exposure to sunlight and to a much smaller extent from diet. Activation of vitamin D requires two sequential hydroxylation steps. The first step occurs mainly in the liver where 25-hydroxylase converts vitamin D3 to the primary circulating or storage form, 25-hydroxyvitamin D3 (25D3)3 (2). The second step is conventionally known to take place in the kidneys, but increasing number of tissues have been found to express 1α-hydroxylase (Cyp27B1), the enzyme responsible for the final and rate-limiting step in the synthesis of the active 1,25-dihydroxyvitamin D3 (1,25D3) (3 , 4). Expression of 1α-hydroxylase has been reported in epithelial cells of the skin (keratinocytes) (5, 6), intestine (7, 8), breast (9), and prostate (10) and in cells of the immune system including macrophages (11, 12, 13), monocytes (14), and dendritic cells (15). Vitamin D is inactivated by a ubiquitous enzyme, 24-hydroxylase. The biological effects of vitamin D are achieved through the regulation of gene expression mediated by the vitamin D receptor (VDR) (16). Active vitamin D binds to VDR, and upon ligand binding the receptor dimerizes with the retinoic X receptor (17), and this complex binds to vitamin D-responsive elements (VDRE) within the promoter regions of vitamin D-responsive genes (18). Transcriptional activation is enhanced by nuclear receptor coactivator proteins, such as steroid receptor coactivators (SRC) and proteins of the vitamin D receptor-interacting protein complex, that are recruited after the VDR complex binds to the VDRE element (19). VDR modulates the expression of a long list of genes in a cell- and tissue-specific manner. A number of these genes play a role in immunity. The first evidence suggesting that vitamin D has important immunomodulatory effects comes from epidemiological data showing that individuals with low 25D3 levels are more susceptible to Mycbacterium tuberculosis infection and often have a more severe course of disease (20, 21). Furthermore, several case-control studies have found an association between VDR polymorphisms and susceptibility to tuberculosis (22, 23, 24). A recent translational study indicates that the reason for these findings is insufficient levels of the antimicrobial protein, cathelicidin, in individuals with low vitamin D levels. In this study, activation of TLR2/1 by a mycobacterial ligand triggered up-regulation of cathelicidin mRNA and increased killing of mycobacteria by macrophages in the presence of vitamin D (25). A subsequent study in skin epithelial cells (keratinocytes) showed that skin injury or infection (TLR2/6 ligand) leads to activation of vitamin D and up-regulation of at least two vitamin D-dependent genes, the cathelicidin antimicrobial peptide and the TLR coreceptor, CD14, involved in innate immunity (6). The genes encoding for cathelicidin (26, 27, 28) and CD14 (29) have VDREs within their promoters and are positively regulated by vitamin D. Both are primarily expressed in myeloid cells but have also been found in respiratory epithelial cells (30, 31, 32, 33). The epidemiological data linking vitamin D effects to outcomes of tuberculosis provide clinically relevant information that reveal the importance of this hormone to innate immunity in the lung. In these studies, we demonstrate for the first time that primary airway epithelial cells constitutively convert inactive to active vitamin D. We demonstrate that the conversion results in activation of vitamin D-responsive genes leading to production of proteins that are important for innate immunity. In contrast to other studies in other tissues, we could find no synergy of TLR2 ligands with vitamin D. Instead, we found that dsRNA, which activates a number of receptors, including TLR3, acts in a synergistic manner with vitamin D to activate vitamin D-responsive genes in airway epithelial cells. 1,25D3 and 25D3 were obtained from Calbiochem. Itraconazole came from Ortho Biotech. Sodium butyrate was purchased from Sigma-Aldrich. Lipoarabinomannan from Mycobacterium smegmatis, the synthetic lipoproteins, Pam3CSK4 and FSL-1, and polyinosinic-polycytidylic acid (poly(IC)) came from InvivoGen. Pronase comes from Roche Diagnostics. hTBE cells were obtained from the Cells and Tissue Core under a protocol approved by the University of Iowa Institutional Review Board. Epithelial cells were isolated from tracheal and bronchial mucosa by enzymatic dissociation (pronase 0.2%) and cultured in Laboratory of Human Carcinogenesis 8e medium on plates coated with collagen-albumin for study up to passage 10, as described previously (34). All experiments were performed with cells from at least three different donors. The A549 human lung carcinomatous epithelial cell line was obtained from American Type Culture Collection. Cells were maintained in 75-cm2 tissue culture flasks (Corning) in minimal essential medium (Invitrogen) with 10% FCS and gentamicin. Alveolar macrophages were obtained from normal nonsmoking volunteers, as described previously (35). Briefly, normal volunteers with a lifetime nonsmoking history, no acute or chronic illness, and no current medications underwent bronchoalveolar lavage. The cell pellet was washed twice in HBSS without Ca2+ and Mg2+ and suspended in complete medium (RPMI tissue culture medium; Invitrogen). Differential cell counts were determined using a Wright-Giemsa-stained cytocentrifuge preparation. All cell preparations contained between 90 and 100% alveolar macrophages. This study was approved by the Committee for Investigations Involving Human Subjects at the University of Iowa. For infection, cells at 80% confluency were treated with human RSV strain A-2 (multiplicity of infection, 1). Viral stocks were obtained from Advanced Biotechnologies. The initial stock (1 × 107.33 TCID50/ml) was kept frozen at −135°F. The virus was never refrozen. 1,25D3 was quantified using an enzyme immunoassay kit for 1,25D3 (Immunodiagnostic Systems) according to the manufacturer’s instructions. Total RNA was isolated using the Absolutely RNA real-time PCR Miniprep kit (Stratagene) following the manufacturer’s instructions. RNA was quantitated using the RiboGreen kit (Invitrogen). Total RNA (1 μg) was reverse transcribed to cDNA using iScript cDNA Synthesis kit (Bio-Rad Laboratories) according to the manufacturer’s instructions. PCR reactions were performed using 2 μl of cDNA and 48 μl of master mix containing iQ SYBR Green Supermix (Bio-Rad), 15 pmol of forward primer, and 15 pmol of reverse primer, in a MyiQ Single-Color Real-Time PCR Detection System as follows: 3 min at 95°C, followed by 45 cycles of 20 s at 95°C, 20 s at 60°C, and 20 s at 72°C. The fluorescence signal generated with SYBR Green I DNA dye was measured during annealing steps. Specificity of the amplification was confirmed using melting curve analysis. Data were collected and recorded by MyiQ Optical System Software version 2.0 (Bio-Rad) and expressed as a function of threshold cycle (Ct). The gene-specific Ct values of each sample were then corrected by subtracting the Ct for the housekeeping gene HPRT (ΔCt). Untreated controls were chosen as the reference samples, and the ΔCt values for all experimental samples were subtracted from the ΔΔCt for the control samples. Finally, the sample mRNA abundance was calculated by the formula 2ΔΔCt. Results were expressed as fold change from control. Specific primer sets used are as follows (5′ to 3′): Cyp27B1 AACCCTGAACAACGTAGTCTGCGA (forward), ATGGTCAACAGCGTGGACACAAA (reverse); Cyp24A1 TTGGCTCTTTGTTGGATTGTCCGC (forward), TGAAGATGGTGCTGACACAGGTGA (reverse); cathelicidin ACACAGCAGTCACCAGAGCATTGT (forward), ATTTCTCAGAGCCCAGAAGCCTGA (reverse); CD14 ACATAAACTGTCAGAGGCAGCC GA (forward), TCTTCATCGTCCAGCTCACAAGGT (reverse) and HPRT GCAGACTTTGCTTTCCTTGG (forward), AAGCAGATGGCCACAGAACT (reverse). Gene-specific primers were custom synthesized and purchased from Integrated DNA Technologies, based on design using gene-specific nucleotide sequences from the National Center for Biotechnology Information sequence databases and PrimerQuest web interface (Integrated DNA Technologies). Whole-cell protein was obtained by lysing the cells in 200 μl of lysis buffer (0.05 M Tris (pH 7.4), 0.15 M NaCl, 1% Nonidet P-40, with added protease and phosphatase inhibitors: 1 protease minitab (Roche Biochemicals)/10 ml and 100 μl of 100× phosphatase inhibitor mixture (Calbiochem)/10 ml. The lysates were sonicated for 20 s, kept at 4°C for 30 min, and spun at 15,000 × g for 10 min; the supernatant was saved. Protein determinations were made using a protein measurement kit (Bradford Protein Assay) from Bio-Rad. Cell lysates were stored at −70°C until use. Western analysis for the presence of Cyp24A1 and cathelicidin/LL-37 was performed. For Cyp24A1, 30 μg of protein weres mixed 1:1 with 2× sample buffer (20% glycerol, 4% SDS, 10% 2-ME, 0.05% bromophenol blue, 1,25 M Tris, pH 6.8), loaded onto a 12% SDS-PAGE gel, and run at 150 V for 90 min. For cathelicidin, 50 μg of protein were mixed 2:1 with 2× sample buffer (30% glycerol, 3% SDS, 6% 2-ME, 0.05% bromophenol blue, 150 mM Tris, pH 7.0), loaded onto a 16.5% Tris-Tricine/peptide gel (Bio-Rad), and run in Tris-Tricine buffer (Bio-Rad) at 100 V for 120 min. Cell proteins were transferred to Immuno-Blot polyvinylidene difluoride (PVDF) membrane (Bio-Rad) with a Bio-Rad semidry transfer system, according to the manufacturer’s instructions. The PVDF was then incubated with Cyp24A1 Ab (Santa Cruz Biotechnology) at a dilution of 1/200 in 5% milk in Tris-buffered saline with 0.1% Tween 20 or with LL-37/CAP18 Ab (Hycult Biotechnology) at a dilution of 1/500 overnight. The blots were washed three times with Tris-buffered saline with 0.1% Tween 20 and incubated for 1 h with HRP-conjugated anti-IgG Ab at dilutions of 1/10,000. Immunoreactive bands were developed using a chemiluminescent substrate, ECL Plus (Amersham Biosciences). An autoradiograph was obtained, with exposure times of 30 s for Cyp24A1 and 5 min for cathelicidin/LL-37. Equal loading of proteins was confirmed with β-actin (Sigma-Aldrich) at a dilution of 1/40,000 (both primary and secondary Abs). After designated times in culture, supernatants were collected and frozen at −70°C. LL-37 in supernatants was analyzed using an Immuno Dot Blot Kit (Phoenix Pharmaceuticals) according to the manufacturer’s protocol. Briefly, the peptide was immobilized on a PVDF membrane with a dot-blot apparatus. After blocking, the membrane was incubated with the purified primary Ab (IgG) at a dilution of 1/1000 for 1 h at room temperature. The membrane was washed and then incubated with an anti-IgG secondary Ab conjugated to HRP for 30 min. After a washing, the membrane was developed with ECL, and an autoradiograph was obtained. CD14 concentrations in cell culture supernatants were determined using DuoSet ELISA kits from R&D Systems. Statistical analysis was performed on vitamin D conversion, ΔCt obtained by real-time PCR and CD14 ELISA. When we were interested in comparing three or more groups, we used repeated measures ANOVA followed by Bonferroni’s method to control for multiple comparisons. When two groups were being compared we used a one- or two-tailed Student t test depending on the hypothesis in question. Data are presented as mean ± SEM. A p value of <0.05 was considered statistically significant. These methods were performed using GraphPad Prizm 5 for Windows (GraphPad Software). The primary circulating form of vitamin D is 25D3, and the serum levels of this hormone are used to determine vitamin D status of individuals. 1α-Hydroxylase is required to convert this inactive form of vitamin D into its active form, 1,25D3. We hypothesized that respiratory epithelial cells have the enzymatic machinery required to activate vitamin D and are able to convert inactive 25D3 to its active form, 1,25D3. We initially examined the baseline expression of 1α-hydroxylase (activating enzyme) and 24-hydroxylase (inactivating enzyme) in hTBE cells and in A549 cells, a human alveolar basal carcinoma epithelial cell line. We found that based on expression of hydroxylases, hTBEs seemed primed to activate vitamin D. They expressed high levels of mRNA coding for the activating enzyme but very low levels of mRNA coding for the inactivating enzyme. We found the opposite to be true for A549 cells (Fig. 1⇓A). We then examined whether the hydroxylase mRNA expression profile translated into conversion of inactive to active vitamin D. hTBEs were treated with increasing amounts of inactive vitamin D (25D3), and levels of active vitamin D (1,25D3) in supernatants were measured 24 h later. Consistent with expression levels of hydroxylases, we found that the hTBEs converted 25D3 to 1,25D3, when exposed to inactive vitamin D without other stimuli (Fig. 1⇓B). Furthermore, when A549 cells were treated with 25D3 (10−7 M) for 24 h, there was no active vitamin D in the supernatants, suggesting that these cells have lost the ability to activate vitamin D (data not shown). The A549 data are in agreement with the expression of hydroxylases in this cell type. Primary respiratory epithelial cells are primed to convert inactive vitamin D to its active form. A, Cells were cultured in media for 24 h and harvested. mRNA was measured using quantitative real-time PCR. At baseline, hTBE cells express relatively high levels of the activating 1α-hydroxylase (Cyp27B1) and low levels of the inactivating 24-hydroxylase (Cyp24A1), whereas the opposite is true for the cancer cell line, A549 cells. Graph reflects mean relative expression of hydroxylases compared with HPRT and SEM of three or more independent experiments. B, hTBE cells were treated with increasing doses of inactive vitamin D (25D3), and active vitamin D (1,25D3) was measured in supernatants 24 h later. hTBE cells convert the inactive 25D3 to the active 1,25D3. When inactive vitamin D is added to medium without cells, no active vitamin D is detected. Graph reflects mean 1,25D3 levels and SEM of three or more independent experiments. Student’s t test, ∗∗, p < 0.01. 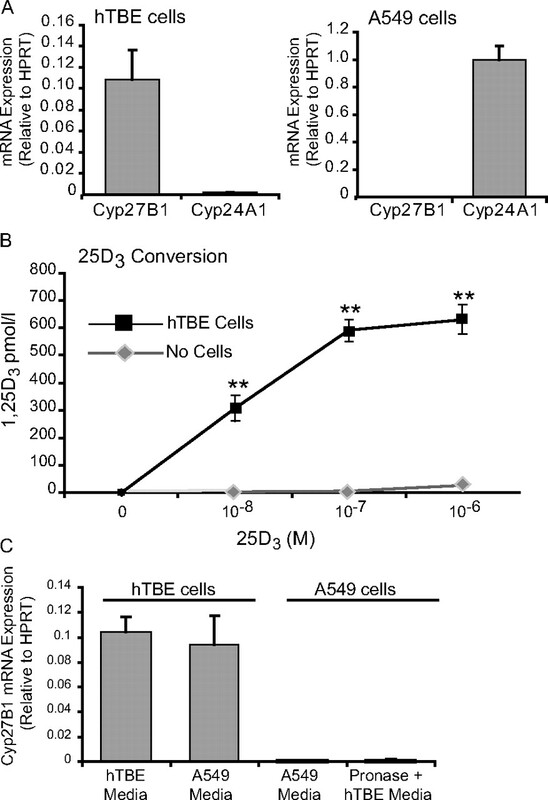 C, hTBE cells were cultured in their regular medium or A549 medium, and A549 cells were cultured in their regular medium or exposed to pronase 0.2% and then cultured in hTBE medium and baseline expression of Cyp27B1 measured. No change was seen in expression of Cyp27B1 in either cell type. Graph reflects mean relative expression of Cyp27B1 compared with HPRT and SEM of three experiments. We next asked whether the process of isolating primary cells from the donor or difference in culture conditions could explain the dissimilarity in expression of 1α-hydroxylase and thus vitamin D activation in the two cell types. To test this, we treated a confluent flask of A549 cells with the enzyme used to dissociate primary cells from the airways (pronase 0.2%) and then cultured them in primary cell medium for 48 h and examined the expression of 1α-hydroxylase. We found that despite this manipulation the expression remained very low in A549 cells. We also looked at whether changing the primary cells to A549 medium would affect their expression of 1α-hydroxylase. We again found that the medium change did not influence the expression which remained relatively high (Fig. 1⇑C). Extrarenal expression of 1α-hydroxylase has been most extensively studied in macrophages. It is well known that activated macrophages can convert 25D3 to 1,25D3 and that in granulomatous disorders this can lead to hypercalcemia. We were interested in knowing how macrophages and hTBEs compared with regard to baseline (constitutive) expression of hydroxylases and activation of vitamin D. We found that primary human alveolar macrophages expressed similar levels of 1α-hydroxylase mRNA as hTBEs and no 24-hydroxylase. However, although these cells seemed to be primed to activate vitamin D when treated with 25D3 (10−7 M), they did not convert it to 1,25D3 (data not shown). This finding concords with other studies showing that to convert 25D3 to 1,25D3, macrophages need to be activated (36, 37). The biological effects of active vitamin D result from altered gene expression via the nuclear receptor and transcription factor, VDR. Having established that respiratory epithelial cells can generate active vitamin D, we hypothesized that when exposed to the inactive form of vitamin D, hTBE cells would convert it to 1,25D3, and VDR-regulated genes would be trans-activated. At the outset, we looked at the prototypic and most investigated vitamin D-dependent gene, Cyp24A1, which codes for 24-hydroxylase. This enzyme adds a hydroxyl group to both 25D3 and 1,25D3 and induces their catabolism. We treated primary epithelial cells with 10−7 M concentrations of either the active or inactive form of vitamin D (1,25D3 or 25D3) and examined mRNA expression. Optimum serum levels of 25D3 are between 30 and 80 ng/ml; thus, we chose to use 10−7 M (equals 40 ng/ml) for these studies and all subsequent experiments. For consistency, we used the same dose of 1,25D3. We found that regardless of which form was used there was a very significant increase in transcription of the Cyp24A1 gene and an increase in 24-hydroxylase protein (Fig. 2⇓A). These data suggest that exposing hTBEs to inactive vitamin D results in formation of a transcriptionally active VDR complex that results in both increased mRNA and protein of a gene known to contain VDREs in its promoter. Locally activated 25D3 induces vitamin D-driven genes to the same extent as exogenous 1,25D3. A–C, hTBE cells were treated with either active (10−7 M) or inactive vitamin D (10−7 M) for 24 h. Cells were harvested, and Cyp24A1 (A), cathelicidin (B), and CD14 (C) mRNA was measured using quantitative real-time PCR. There is a significant induction of vitamin D-driven genes in cells exposed to either 1,25D3 or 25D3 when compared with control. Values reflect mean fold increase from control and SEM of three or more independent experiments. Repeated-measures ANOVA with Bonferroni’s test for multiple comparisons. 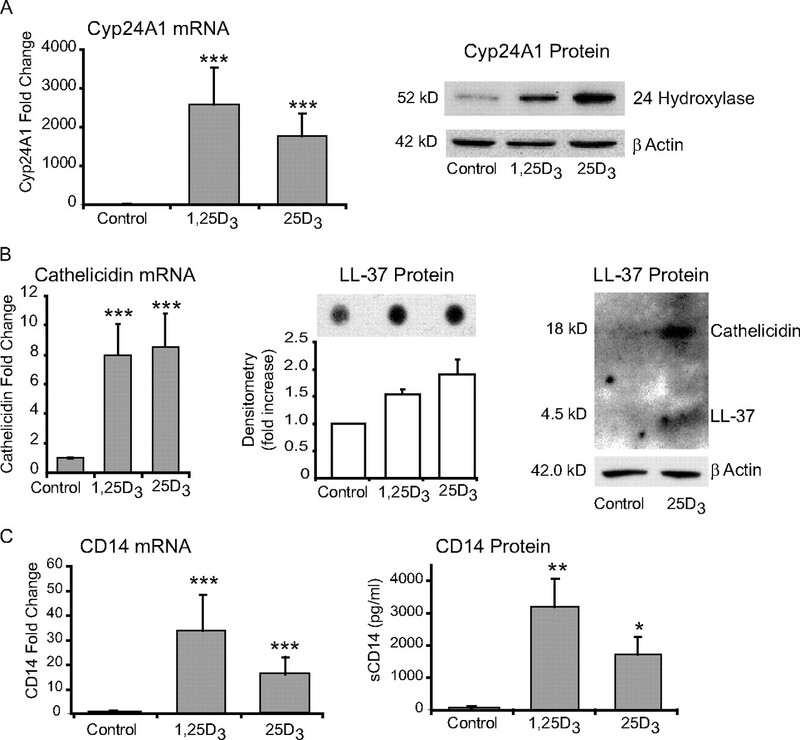 Protein levels were analyzed in cell lysates by Western blot (Cyp24A1 and hCAP-18/LL-37) or in supernatants by dot blot (LL-37) or ELISA (CD14), and a similar trend was seen as for the mRNA. Differences from control; ∗, p < 0.05; ∗∗, p < 0.01; ∗∗∗, p < 0.001. Subsequently, we wanted to examine vitamin D-regulated genes that play a more direct role in innate immunity. Lung epithelium covers the entire bronchial and alveolar surface in the lung. It is constantly exposed to microorganisms, requiring appropriate immune responses to protect the lung (31, 38). hTBEs express pattern recognition molecules, including TLRs, that sense pathogens (39) and respond to pathogen exposure by increasing the release of antimicrobial substances (30), and chemokines and cytokines that initiate an inflammatory reaction. To examine the role of generation of active vitamin D by airway epithelium in innate immunity, we chose two known VDR-responsive genes that represent both antibacterial molecules (cathelicidin) and the receptors involved in immune surveillance (CD14). The cathelicidin antimicrobial peptide gene is a VDR-dependent gene that codes for the human cationic antimicrobial protein of 18 kDa (hCAP-18). hCAP-18 is proteolytically processed, resulting in the release of the antimicrobial peptide LL-37 (26, 27, 28). In addition to broad spectrum of antimicrobial activity against bacteria (including mycobacteria), fungi, and viral pathogens (33, 40), LL-37 neutralizes endotoxin (LPS) (41) and functions as a chemoattractant for mononuclear cells and neutrophils (42). The other vitamin D-regulated gene involved in early host defense is CD14 (29). CD14 is a glycoprotein that can be either membrane bound (mCD14) or soluble (sCD14). CD14 is an important cofactor in the recognition of both LPS from Gram-negative bacteria (43, 44, 45) and lipoteichoic acid from Gram-positive bacteria (46, 47, 48) via TLR4 and TLR2, respectively. CD14 has also been shown to enhance dsRNA-mediated TLR3 activation (49). Autocrine up-regulation of these molecules in the lungs by vitamin D has the potential of enhancing local innate immunity. As in the previous experiments, we treated primary airway epithelial cells with either 1,25D3 or 25D3. Similarly to Cyp24A1, we found a significant increase in transcription of both cathelicidin and CD14 mRNA when cells were treated with either form of vitamin D (Fig. 2⇑, B and C). We next examined the effect of increased mRNA on protein levels. We first looked for the antimicrobial peptide LL-37 in culture supernatants and found that cells treated with either form of vitamin D had higher levels than untreated cells (Fig. 2⇑B). We demonstrated this using a dot blot assay that was specific for the LL-37 cleavage product of cathelicidin. We then examined cell lysates and observed that 25D3 up-regulates intracellular hCAP-18. We also found a lighter band at 4.5 kDa which is the size of LL-37 (Fig. 2⇑B). This suggests that at the protein level vitamin D primarily increases expression of hCAP-18, making it available for proteolytic cleavage to the antimicrobial peptide LL-37 when needed. It also suggests that there may be a small reservoir of LL-37 in airway epithelial cells following exposure to inactive vitamin D.
When we looked for CD14, we found that respiratory epithelial cells express very little if any membrane-bound CD14 (data not shown). However, in the presence of 1,25D3 or 25D3, soluble CD14 was found in supernatants (Fig. 2⇑C). Taken together, these data show that 1,25D3 generated by hTBE cells is biologically active and up-regulates vitamin D-driven genes to the same extent as exogenous exposure to 1,25D3. Higher levels of LL-37 and CD14 within the lungs have the potential of locally enhancing innate immunity. To definitively link 1α-hydroxylase expressed by hTBE cells to 1,25D3 generation and induction of VDR-driven genes, we introduced a chemical inhibitor of this enzyme, itraconazole, into our system. Pretreating hTBEs with itraconazole significantly reduced their ability to convert 25D3 to 1,25D3 (Fig. 3⇓A). We then examined the effects of itraconazole on the induction of vitamin D-regulated genes by 25D3. We found that in the presence of itraconazole there was significantly less induction of all three vitamin D-regulated genes by 25D3 (Fig. 3⇓B). These results illustrate that in the presence of itraconazole less 25D3 is being converted to 1,25D3, resulting in less induction of vitamin D-driven genes. This further supports our primary hypothesis that 1α-hydroxylase converts inactive vitamin D to active vitamin D in respiratory epithelial cells. Itraconazole, a chemical inhibitor of 1α-hydroxylase (Cyp27B1), reduces conversion of 25D3 to 1,25D3 and attenuates up-regulation of vitamin D-regulated genes. hTBE cells were treated with 25D3 (10−7 M) for 24 h with or without pretreatment with itraconazole (10−6 M) for 2 h. A, 1,25D3 was measured in supernatants. Cells pretreated with itraconazole are significantly less efficient in converting 25D3 to 1,25D3. Values are mean 1,25D3 levels and SEM of four independent experiments. B, mRNA levels of vitamin D-regulated genes were measured using quantitative real-time PCR. Pretreatment with itraconazole attenuates vitamin D-induced trans activation of Cyp24A1, cathelicidin, and CD14. Values are the mean fold increase from control and SEM of three or more independent experiments. Student’s t test. VDR mediates the biological actions of 1,25D3. VDR forms a heterodimer with retinoid X receptor, binds to VDREs in the promoter region of target genes, and regulates transcription. Transcriptional activation requires nuclear receptor coactivator proteins such as SRCs. SRCs have histone acetylation activity themselves and also recruit additional histone acetylators, including CREB-binding protein (CBP), resulting in increased histone acetylation and opening of the chromatin (50). Prior studies have shown that histone acetylation is important for 1,25D3-driven expression of cathelicidin and CD14 in keratinocytes and in gastrointestinal cells (6, 51, 52). We hypothesized that increasing histone acetylation at VDRE-containing promoters with a histone deacetylase (HDAC) inhibitor would increase induction of VDR-driven genes by either form of vitamin D. hTBEs were treated with 1,25D3 or 25D3 in the presence or absence of the HDAC inhibitor butyrate. Histone acetylation via the addition of butyrate augmented vitamin D-induced expression of cathelicidin and CD14 (in cells treated with either 25D3 or 1,25D3; Fig. 4⇓). These data show that gene expression is regulated similarly in cells treated with 25D3 or 1,25D3 and further supports that 25D3 is being converted by hTBE cells into the active form, which then binds to VDR and influences vitamin D-regulated genes. Chromatin modifications augment the effects of 1,25D3 and 25D3 on vitamin D-regulated genes. hTBE cells were treated with 1,25D3 (10−7 M) or 25D3 (10−7 M) for 24 h with or without the HDAC inhibitor butyrate (2 mM), and mRNA levels of vitamin D-regulated genes were measured using quantitative real-time PCR. 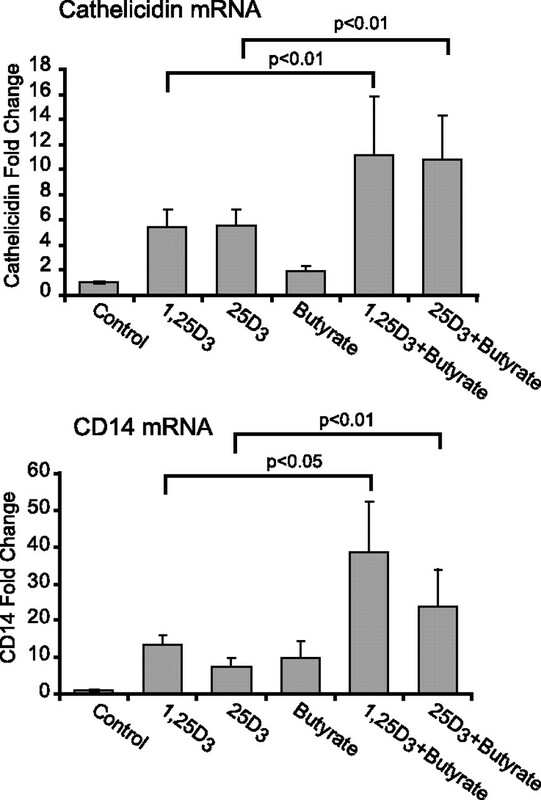 Butyrate significantly increases vitamin D induced up-regulation of cathelicidin and CD14 regardless of which form of vitamin D is used. Values are the mean fold increase from control and SEM of five independent experiments. Repeated-measures ANOVA with Bonferroni’s test for multiple comparisons. Recent studies have shown that in monocytes TLR2/1 activation by a mycobacterial ligand induces the expression of 1α-hydroxylase and triggers up-regulation of cathelicidin in the presence of 25D3 (25). Differently from respiratory epithelial cells, in monocytes 25D3 did not induce cathelicidin unless a TLR ligand was present, suggesting that these cells are not activating vitamin D at baseline. A subsequent study in skin epithelial cells (keratinocytes) showed that TLR2/6 ligands lead to activation of vitamin D and up-regulation of cathelicidin (6). Respiratory epithelial cells express TLR and are important players in host defense in the lungs. Having established that respiratory epithelial cells activate vitamin D and lead to up-regulation of cathelicidin, we asked whether TLR2 ligands had any effects on this system. hTBE cells were treated with the following TLR2 ligands: lipoarabinomannan from M. smegmatis, a lipoglycan from the envelop of mycobacteria; Pam3CSK4, a synthetic bacterial lipoprotein and a TLR2/1 ligand; and FSL-1, a synthetic lipoprotein and a TLR2/6 ligand. We found that, unlike in monocytes and keratinocytes, none of those TLR2 ligands influenced the expression of 1α-hydroxylase in respiratory epithelial cells (supplement 1A).4 Furthermore when we looked at the expression of cathelicidin mRNA we found that TLR2 ligands did not enhance vitamin D induced up-regulation of cathelicidin (supplement 1B). These data indicate that TLR2 ligands do not influence the activation of vitamin D by respiratory epithelial cells or the expression of vitamin D-regulated genes. This finding is different from what has been shown in monocytes and keratinocytes, perhaps because respiratory epithelial cells constitutively express 1α-hydroxylase and constitutively activate vitamin D.
We next asked whether viruses had any effect on expression of 1α-hydroxylase and thus potentially vitamin D conversion. dsRNA is a molecular pattern associated with viral infection. It is produced by most viruses at some point during their replication. Sensors for dsRNA include TLR3, retinoic acid-inducible gene I (RIG-I), melanoma differentiation-associated gene 5 (MDA-5), and dsRNA-dependent protein kinase (53, 54, 55, 56) and their activation triggers antiviral responses. Poly(IC) is a synthetic analog of dsRNA that is a ligand for TLR3. We started out by stimulating hTBE cells with poly(IC) for 24 h and examining 1α-hydroxylase mRNA expression. Unlike the TLR2 ligands, poly(IC) significantly increased the expression of 1α-hydroxylase. Furthermore the respiratory epithelium converted more 25D3 to 1,25D3 when poly(IC) was present (Fig. 5⇓A). We then looked at the expression of cathelicidin and found that poly(IC) alone has no effect its transcription; however, when hTBEs are exposed to poly(IC) in the presence of 25D3, there is significantly greater amplification of cathelicidin mRNA than by 25D3 alone (Fig. 5⇓B). In contrast to the synergistic effect of coupling 25D3 exposure and poly(IC) on cathelicidin expression, vitamin D decreased the poly(IC)-induced expression of the chemokine, IL-8 (Fig. 5⇓B). Viral RNA increases both the expression of 1α-hydroxylase and conversion of 25D3 to 1,25D3 and synergizes with vitamin D to induce the antimicrobial gene cathelicidin. A and B, hTBE cells were treated with the synthetic dsRNA, poly(IC), 20 μg/ml, with or without 25D3, 10−7 M, for 24 h, and cells were harvested for RNA. mRNA was measured using quantitative real-time PCR. 1,25D3 was measured in supernatants. A, Poly(IC)-treated cells have significantly higher expression of 1α-hydroxylase than control cells and convert more 25D3 to 1,25D3. B, Poly(IC) alone does not induce cathelicidin mRNA unless vitamin D is present and then the two synergize. Vitamin D attenuates the poly(IC) induced induction of IL-8 mRNA. C and D, hTBE cells were infected with RSV (multiplicity of infection, 1) for 24 h in the presence or absence of 25D3 (10−7 M) and harvested for RNA. mRNA was measured using quantitative real-time PCR. 1,25D3 was measured in supernatants. C, As with poly(IC), 1α-hydroxylase mRNA is significantly higher in RSV-treated cells than in control cells and RSV-infected cells are more efficient in converting 25D3 to 1,25D3. D, Different from poly(IC), RSV alone does induce cathelicidin, but like poly(IC) vitamin D and the virus synergize to induce cathelicidin. Values are the mean and SEM of four or more independent experiments. When comparing two groups, a paired Student t test was used. For all other comparisons, repeated-measures ANOVA with Bonferroni’s test for multiple comparisons was applied. Differences from control; ns is nonsignificant, ∗∗, p < 0.01; ∗∗∗, p < 0.001. Finally we investigated the effects of a live virus, RSV. Like poly(IC), RSV up-regulated the expression of 1α-hydroxylase in respiratory epithelial cells. Consistent with higher levels of the activating enzyme, cells that were infected with RSV were more efficient in converting 25D3 to 1,25D3 (5C). Unlike poly(IC), RSV alone did increase the expression of cathelicidin, but as with poly(IC), RSV and 25D3 together synergistically increased cathelicidin mRNA in hTBE cells (5D). Neither poly(IC) nor RSV increased the expression of 1α-hydroxylase in A549 cells (data not shown). Combined, these data suggest that dsRNA induces 1α-hydroxylase and vitamin D conversion in primary epithelial cells and that vitamin D and dsRNA synergize to induce expression of the antimicrobial gene cathelicidin. The main finding of this study was that respiratory epithelial cells constitutively activate vitamin D and are capable of creating a microenvironment that has high levels of active form of the vitamin. Activation has downstream effects that include up-regulation of the cathelicidin antimicrobial peptide gene and the TLR, coreceptor, CD14. Viral infection leads to increased activation of vitamin D and further increases in cathelicidin mRNA. Cathelicidin is known to be an important component of innate immunity in the lungs and thus local vitamin D activation might be an important component of host defense. 1α-hydroxylase is the key determinant in the synthesis of active vitamin D. This enzyme was first found in the kidneys where it has the highest expression. Extrarenal 1α-hydroxylation was first described in 1979 in pregnant rats (57) and has since been found in other tissues, including cells of the immune system (monocytes, macrophages, dendritic cells) and in epithelial cells at various barrier sites (skin, gastrointestinal tract) (5, 6, 7, 8, 9, 10, 11, 12, 13, 14, 15). Here we describe for the first time the expression of this enzyme in normal lung epithelial cells. More importantly we show that expression is reflected by synthesis of the active 1,25D3. The metabolic control of 1α-hydroxylase activity at extrarenal sites seems to be different from that in renal epithelial cells. Renal 1α-hydroxylase is under stringent regulation by calcitropic factors like parathyroid hormone (PTH), calcitonin, calcium and phosphorus in addition to negative feedback by 1,25D3 itself. Less is known about control of 1α-hydroxylase activity at extrarenal sites but macrophage and prostate 1α-hydroxylase is relatively immune to stimulation by calcium or PTH and to feedback inhibition by 1,25D3 (14, 58, 59, 60, 61, 62). The lack of negative feedback by 1,25D3 in extrarenal tissue would allow for a microenvironment with higher concentrations of the active vitamin than are seen in serum. Tissue levels (lung or other) of 25D3 are not known but there is no evidence to suggest that they are different from serum levels. Generally serum 25D3 levels of 30 ng/ml or greater are considered to indicate sufficient levels of vitamin D (63). Interestingly when we treated epithelial cells with a physiological amount of inactive vitamin D (10−7 M = 40 ng/ml) they generated approximately 4 times the upper normal limit of active vitamin D over 24 h. Thus, even if 25D3 levels were lower in lung tissue than in serum, it is likely that local levels of active vitamin D are the same or higher. It is well established that the antimicrobial peptide LL-37 plays an important, multifunctional role in innate immunity. We have clearly shown that vitamin D induces expression of cathelicidin mRNA. We detected LL-37 protein in supernatants by dot blot and found that in the presence of vitamin D the levels were increased. The dot blot, although thought to be specific for LL-37, does not definitively distinguish between the active LL-37 and hCAP-18. When we looked at cell lysates by Western blot we saw that 25D3 increases primarily intracellular expression of hCAP-18 and to a lesser extent LL-37. These data suggest that vitamin D induces intracellular hCAP-18 which then is available for stimuli-induced cleavage to the antimicrobial active form, LL-37. Given the large number of airway epithelial cells one can assume that the production of cathelicidin by these cells is of physiological significance. We do believe that cathelicidin does get cleaved by proteases to LL-37 when needed thus making the vitamin D induced production of cathelicidin important for host defense locally. Whether this occurs within the epithelial cells or after secretion is unclear at this point. The presence of 1α-hydroxylase in extrarenal tissues has been proposed as a mechanism by which vitamin D may exert a host of protective actions within these tissues (64). Recent studies have shown that in monocytes/macrophages and in keratinocytes TLR2 ligands induce 1α-hydroxylase and lead to up-regulation of the vitamin D-regulated gene, cathelicidin (6, 25). These studies indicate that local activation of vitamin D by 1α-hydroxylase and subsequent up-regulation of cathelicidin are important for innate immune responses at the site of infection or injury. We did not see induction of 1α-hydroxylase mRNA by TLR 2/1 or TLR 2/6 ligands or up-regulation of cathelicidin in respiratory epithelial cells. This difference might be due to the fact that, unlike monocytes and macrophages, respiratory epithelial cell constitutively activate vitamin D and 25D3 alone increases expression of cathelicidin more effectively than TLR2 ligands and 25D3 together in monocytes. However, when we examined poly(IC) as a model for viral infection or infection with RSV our results were different. We found that dsRNA (poly(IC) and RSV) firstly induced 1α-hydroxylase, secondly increased conversion of inactive to active vitamin D and thirdly increased expression of cathelicidin in the presence of 25D3. Thus during viral infection more circulating vitamin D can be converted to active vitamin D by the respiratory epithelium and expression of the host defense gene cathelicidin is increased. RSV alone augmented the expression of cathelicidin whereas poly(IC) did not. As hTBE cell medium does not contain vitamin D, the up-regulation of cathelicidin by RSV alone is independent of vitamin D. However, vitamin D synergizes with both poly(IC) and RSV to further amplify expression of cathelicidin. The fact that treatment with vitamin D whether alone or in combination with dsRNA boosts the expression of cathelicidin further supports that vitamin D is indeed responsible for up-regulation of this gene. How vitamin D and dsRNA synergize to alter gene expression is not known. Possibly, this is due to interplay between VDR and other transcription factors that are activated during viral infection but further studies are needed. Conversely, when we looked at the NFκB-driven gene coding for the proinflammatory chemokine IL-8, vitamin D attenuated its induction by poly(IC). Poly(IC) can be recognized by the dsRNA sensors TLR3, MDA-5, RIG-I, or dsRNA-dependent protein kinase. At higher doses, poly(IC) is thought to signal primarily through TLR3; and given the doses we used, this is the most likely sensor in our system (53, 55). How vitamin D dampens the expression of IL-8 in response to dsRNA in respiratory epithelial cells is unknown. Competition between different transcription factors for limited amounts of CBP in the nucleus has been proposed to play a role in the coordination of gene expression in response to signaling (65). One possible explanation for the 25D3 inhibition of dsRNA-induced IL-8 is that both VDR and NFκB compete for available CBP and increased VDR activity sequesters CBP away from NFκB needed for IL-8 transcription. Lastly, it is worth noting the difference that we found in expression of 1α-hydroxylase in primary lung epithelial cells and in cancer-derived cells. It is well established that vitamin D has antiproliferative and prodifferentiation properties. There is epidemiological evidence that low levels of 25D3 are associated with increased risk of colon, prostate, and breast cancer (20, 66, 67, 68, 69, 70). A likely explanation of our differential findings between primary cells and the cancer line, A549, is that primary tissues express 1α-hydroxylase and produce active vitamin D locally that has antiproliferative and prodifferentiative effects. Indeed, dysregulated expression and activity of 1α-hydroxylase has been found in various cancer cells (71) including colon (7, 8, 72), breast (73), and prostate (10, 74). Data on lung cancer are sparse, but higher vitamin D levels have been associated with better survival in patients with non-small cell lung cancer (75, 76, 77). 1,25D3 has been found to be a preventive factor in the metastasis of lung cancer in a mouse model (78). In our cellular model, we found that in contrast to primary epithelial cells, the cancer cell-derived lung epithelial cell line, A549 cells, expressed very low levels of 1α-hydroxylase and high levels of 24-hydroxylase. Consistent with these findings, A549 cells did not convert 25D3 to 1,25D3. These finding suggest that lack of 1α-hydroxylase in malignant lung cancer cells and thus lower levels of active vitamin D within the lung could play a role in lung cancer biology. In conclusion, we have shown for the first time that respiratory epithelial cells constitutively express 1α-hydroxylase resulting in local activation of vitamin D. Vitamin D-dependent genes including cathelicidin and CD14 are up-regulated after exposure of airway epithelial cells to the inactive vitamin D precursor raising the possibility of locally enhanced innate immunity. In a viral infection model, dsRNA leads to further up-regulation of 1α-hydroxylase and synergizes with vitamin D to induce cathelicidin. Furthermore, we have shown that the malignant cell line A549 cells have lost the ability to activate vitamin D, which might play a role in lung cancer pathogenesis given that active vitamin D has antiproliferative and prodifferentiation properties. We thank the Cell and Tissue Core at the University of Iowa for providing us with primary airway epithelial cells. We thank Lori Manzel for assistance with primary airway epithelial cell cultures. ↵1 This work was supported by a Veterans Administration Merit Review grant and by National Institutes of Health Grants HL-60316, HL-077431, and HL-079901-01A1 (to G.W.H.) and by Grant RR00059 from the General Clinical Research Centers Program, National Center for Research Resources, National Institutes of Health. ↵3 Abbreviations used in this paper: 25D3, 25-hydroxyvitamin D3; 1,25D3, 1,25-dihydroxyvitamin D3; VDR, vitamin D receptor; VDRE, vitamin D-responsive element; SRC, steroid receptor coactivator; poly(IC), polyinosinic-polycytidylic acid; hTBE, human tracheobronchial epithelial; RSV, respiratory syncytial virus; PVDF, polyvinylidene difluoride; HAT, histone acetyltransferase; CPB, CREB-binding protein; HDAC, histone deacetylase; RIG-I, retinoic acid-inducible gene I; MDA-5, melanoma differentiation-associated gene 5; PTH, parathyroid hormone. Berger, U., P. Wilson, R. A. McClelland, K. Colston, M. R. Haussler, J. W. Pike, R. C. Coombes. 1988. Immunocytochemical detection of 1,25-dihydroxyvitamin D receptors in normal human tissues. J Clin. Endocrinol. Metab. 67: 607-613. Ponchon, G., A. L. Kennan, H. F. DeLuca. 1969. “Activation” of vitamin D by the liver. J. Clin. Invest. 48: 2032-2037. Fraser, D. R., E. Kodicek. 1970. Unique biosynthesis by kidney of a biologically active vitamin D metabolite. 228: 764-766. Zehnder, D., R. Bland, E. A. Walker, A. R. Bradwell, A. J. Howie, M. Hewison, P. M. Stewart. 1999. Expression of 25-hydroxyvitamin D3-1α-hydroxylase in the human kidney. J. Am. Soc. Nephrol. 10: 2465-2473. Bikle, D. D., M. K. Nemanic, E. Gee, P. Elias. 1986. 1,25-Dihydroxyvitamin D3 production by human keratinocytes: kinetics and regulation. J. Clin. Invest. 78: 557-566. Schauber, J., R. A. Dorschner, A. B. Coda, A. S. Buchau, P. T. Liu, D. Kiken, Y. R. Helfrich, S. Kang, H. Z. Elalieh, A. Steinmeyer, et al 2007. Injury enhances TLR2 function and antimicrobial peptide expression through a vitamin D-dependent mechanism. J. Clin. Invest. 117: 803-811. Tangpricha, V., J. N. Flanagan, L. W. Whitlatch, C. C. Tseng, T. C. Chen, P. R. Holt, M. S. Lipkin, M. F. Holick. 2001. 25-Hydroxyvitamin D-1α-hydroxylase in normal and malignant colon tissue. Lancet 357: 1673-1674. Ogunkolade, B. W., B. J. Boucher, P. D. Fairclough, G. A. Hitman, S. Dorudi, P. J. Jenkins, S. A. Bustin. 2002. Expression of 25-hydroxyvitamin D-1-α-hydroxylase mRNA in individuals with colorectal cancer. Lancet 359: 1831-1832. Kemmis, C. M., S. M. Salvador, K. M. Smith, J. Welsh. 2006. Human mammary epithelial cells express CYP27B1 and are growth inhibited by 25-hydroxyvitamin D3, the major circulating form of vitamin D3. J. Nutr. 136: 887-892. Schwartz, G. G., L. W. Whitlatch, T. C. Chen, B. L. Lokeshwar, M. F. Holick. 1998. Human prostate cells synthesize 1,25-dihydroxyvitamin D3 from 25-hydroxyvitamin D3. Cancer Epidemiol. Biomarkers Prev. 7: 391-395. Adams, J. S., O. P. Sharma, M. A. Gacad, F. R. Singer. 1983. Metabolism of 25-hydroxyvitamin D3 by cultured pulmonary alveolar macrophages in sarcoidosis. J. Clin. Invest. 72: 1856-1860. Adams, J. S., M. A. Gacad, F. R. Singer, O. P. Sharma. 1986. Production of 1,25-dihydroxyvitamin D3 by pulmonary alveolar macrophages from patients with sarcoidosis. Ann. NY Acad. Sci. 465: 587-594. Bell, N. H.. 1998. Renal and nonrenal 25-hydroxyvitamin D-1α-hydroxylases and their clinical significance. J. Bone Miner. Res. 13: 350-353. Kreutz, M., R. Andreesen, S. W. Krause, A. Szabo, E. Ritz, H. Reichel. 1993. 1,25-Dihydroxyvitamin D3 production and vitamin D3 receptor expression are developmentally regulated during differentiation of human monocytes into macrophages. Blood 82: 1300-1307. Sigmundsdottir, H., J. Pan, G. F. Debes, C. Alt, A. Habtezion, D. Soler, E. C. Butcher. 2007. DCs metabolize sunlight-induced vitamin D3 to “program” T cell attraction to the epidermal chemokine CCL27. Nat. Immunol. 8: 285-293. Baker, A. R., D. P. McDonnell, M. Hughes, T. M. Crisp, D. J. Mangelsdorf, M. R. Haussler, J. W. Pike, J. Shine, B. W. O'Malley. 1988. Cloning and expression of full-length cDNA encoding human vitamin D receptor. Proc. Natl. Acad. Sci. USA 85: 3294-3298. MacDonald, P. N., D. R. Dowd, S. Nakajima, M. A. Galligan, M. C. Reeder, C. A. Haussler, K. Ozato, M. R. Haussler. 1993. Retinoid X receptors stimulate and 9-cis retinoic acid inhibits 1,25-dihydroxyvitamin D3-activated expression of the rat osteocalcin gene. Mol. Cell. Biol. 13: 5907-5917. Sutton, A. L., P. N. MacDonald. 2003. Vitamin D: more than a “bone-a-fide” hormone. Mol. Endocrinol. 17: 777-791. Rachez, C., L. P. Freedman. 2000. Mechanisms of gene regulation by vitamin D3 receptor: a network of coactivator interactions. Gene 246: 9-21. Giovannucci, E., Y. Liu, E. B. Rimm, B. W. Hollis, C. S. Fuchs, M. J. Stampfer, W. C. Willett. 2006. Prospective study of predictors of vitamin D status and cancer incidence and mortality in men. J. Natl. Cancer Inst. 98: 451-459. Wilkinson, R. J., M. Llewelyn, Z. Toossi, P. Patel, G. Pasvol, A. Lalvani, D. Wright, M. Latif, R. N. Davidson. 2000. Influence of vitamin D deficiency and vitamin D receptor polymorphisms on tuberculosis among Gujarati Asians in west London: a case-control study. Lancet 355: 618-621. Roth, D. E., G. Soto, F. Arenas, C. T. Bautista, J. Ortiz, R. Rodriguez, L. Cabrera, R. H. Gilman. 2004. Association between vitamin D receptor gene polymorphisms and response to treatment of pulmonary tuberculosis. J. Infect. Dis. 190: 920-927. Bornman, L., S. J. Campbell, K. Fielding, B. Bah, J. Sillah, P. Gustafson, K. Manneh, I. Lisse, A. Allen, G. Sirugo, et al 2004. Vitamin D receptor polymorphisms and susceptibility to tuberculosis in West Africa: a case-control and family study. J. Infect. Dis. 190: 1631-1641. Lewis, S. J., I. Baker, G. Davey Smith. 2005. Meta-analysis of vitamin D receptor polymorphisms and pulmonary tuberculosis risk. Int. J. Tuberc. Lung Dis. 9: 1174-1177. Liu, P. T., S. Stenger, H. Li, L. Wenzel, B. H. Tan, S. R. Krutzik, M. T. Ochoa, J. Schauber, K. Wu, C. Meinken, et al 2006. Toll-like receptor triggering of a vitamin D-mediated human antimicrobial response. Science 311: 1770-1773. Gombart, A. F., N. Borregaard, H. P. Koeffler. 2005. Human cathelicidin antimicrobial peptide (CAMP) gene is a direct target of the vitamin D receptor and is strongly up-regulated in myeloid cells by 1,25-dihydroxyvitamin D3. FASEB J. 19: 1067-1077. Weber, G., J. D. Heilborn, C. I. Chamorro Jimenez, A. Hammarsjo, H. Torma, M. Stahle. 2005. Vitamin D induces the antimicrobial protein hCAP18 in human skin. J. Invest. Dermatol. 124: 1080-1082. Zhang, D. E., C. J. Hetherington, D. A. Gonzalez, H. M. Chen, D. G. Tenen. 1994. Regulation of CD14 expression during monocytic differentiation induced with 1 α,25-dihydroxyvitamin D3. J. Immunol. 153: 3276-3284. Bals, R., X. Wang, M. Zasloff, J. M. Wilson. 1998. The peptide antibiotic LL-37/hCAP-18 is expressed in epithelia of the human lung where it has broad antimicrobial activity at the airway surface. Proc. Natl. Acad. Sci. USA 95: 9541-9546. Diamond, G., D. Legarda, L. K. Ryan. 2000. The innate immune response of the respiratory epithelium. Immunol. Rev. 173: 27-38. Fearns, C., V. V. Kravchenko, R. J. Ulevitch, D. J. Loskutoff. 1995. Murine CD14 gene expression in vivo: extramyeloid synthesis and regulation by lipopolysaccharide. J. Exp. Med. 181: 857-866. Sorensen, O., K. Arnljots, J. B. Cowland, D. F. Bainton, N. Borregaard. 1997. The human antibacterial cathelicidin, hCAP-18, is synthesized in myelocytes and metamyelocytes and localized to specific granules in neutrophils. Blood 90: 2796-2803. Aldallal, N., E. E. McNaughton, L. J. Manzel, A. M. Richards, J. Zabner, T. W. Ferkol, D. C. Look. 2002. Inflammatory response in airway epithelial cells isolated from patients with cystic fibrosis. Am. J. Respir. Crit. Care Med. 166: 1248-1256. Monick, M. M., A. B. Carter, G. W. Hunninghake. 1999. Human alveolar macrophages are markedly deficient in REF-1 and AP-1 DNA binding activity. J. Biol. Chem. 274: 18075-18080. Reichel, H., H. P. Koeffler, J. E. Bishop, A. W. Norman. 1987. 25-Hydroxyvitamin D3 metabolism by lipopolysaccharide-stimulated normal human macrophages. J. Clin. Endocrinol. Metab. 64: 1-9. Reichel, H., H. P. Koeffler, A. W. Norman. 1987. Synthesis in vitro of 1,25-dihydroxyvitamin D3 and 24,25-dihydroxyvitamin D3 by interferon-γ-stimulated normal human bone marrow and alveolar macrophages. J. Biol. Chem. 262: 10931-10937. Mayer, A. K., M. Muehmer, J. Mages, K. Gueinzius, C. Hess, K. Heeg, R. Bals, R. Lang, A. H. Dalpke. 2007. Differential recognition of TLR-dependent microbial ligands in human bronchial epithelial cells. J. Immunol. 178: 3134-3142. Frohm Nilsson, M., B. Sandstedt, O. Sorensen, G. Weber, N. Borregaard, M. Stahle-Backdahl. 1999. The human cationic antimicrobial protein (hCAP18), a peptide antibiotic, is widely expressed in human squamous epithelia and colocalizes with interleukin-6. Infect. Immun. 67: 2561-2566. Rosenfeld, Y., N. Papo, Y. Shai. 2006. Endotoxin (lipopolysaccharide) neutralization by innate immunity host-defense peptides, peptide properties, and plausible modes of action. J. Biol. Chem. 281: 1636-1643. Haziot, A., G. W. Rong, J. Silver, S. M. Goyert. 1993. Recombinant soluble CD14 mediates the activation of endothelial cells by lipopolysaccharide. J. Immunol. 151: 1500-1507. Hailman, E., H. S. Lichenstein, M. M. Wurfel, D. S. Miller, D. A. Johnson, M. Kelley, L. A. Busse, M. M. Zukowski, S. D. Wright. 1994. Lipopolysaccharide (LPS)-binding protein accelerates the binding of LPS to CD14. J. Exp. Med. 179: 269-277. Wright, S. D., R. A. Ramos, P. S. Tobias, R. J. Ulevitch, J. C. Mathison. 1990. CD14, a receptor for complexes of lipopolysaccharide (LPS) and LPS binding protein. Science 249: 1431-1433. Dessing, M. C., M. Schouten, C. Draing, M. Levi, S. von Aulock, T. van der Poll. 2008. Role played by Toll-like receptors 2 and 4 in lipoteichoic acid-induced lung inflammation and coagulation. J. Infect. Dis. 197: 245-252. Cleveland, M. G., J. D. Gorham, T. L. Murphy, E. Tuomanen, K. M. Murphy. 1996. Lipoteichoic acid preparations of gram-positive bacteria induce interleukin-12 through a CD14-dependent pathway. Infect. Immun. 64: 1906-1912. Schroder, N. W., S. Morath, C. Alexander, L. Hamann, T. Hartung, U. Zahringer, U. B. Gobel, J. R. Weber, R. R. Schumann. 2003. Lipoteichoic acid (LTA) of Streptococcus pneumoniae and Staphylococcus aureus activates immune cells via Toll-like receptor (TLR)-2, lipopolysaccharide-binding protein (LBP), and CD14, whereas TLR-4 and MD-2 are not involved. J. Biol. Chem. 278: 15587-15594. Lee, H. K., S. Dunzendorfer, K. Soldau, P. S. Tobias. 2006. Double-stranded RNA-mediated TLR3 activation is enhanced by CD14. Immunity 24: 153-163. Leo, C., J. D. Chen. 2000. The SRC family of nuclear receptor coactivators. Gene 245: 1-11. Schauber, J., K. Iffland, S. Frisch, T. Kudlich, B. Schmausser, M. Eck, T. Menzel, A. Gostner, H. Luhrs, W. Scheppach. 2004. Histone-deacetylase inhibitors induce the cathelicidin LL-37 in gastrointestinal cells. Mol. Immunol. 41: 847-854. Schauber, J., Y. Oda, A. S. Buchau, Q. C. Yun, A. Steinmeyer, U. Zugel, D. D. Bikle, R. L. Gallo. 2008. Histone acetylation in keratinocytes enables control of the expression of cathelicidin and CD14 by 1,25-dihydroxyvitamin D3. J. Invest. Dermatol. 128: 816-824. Kang, D. C., R. V. Gopalkrishnan, Q. Wu, E. Jankowsky, A. M. Pyle, P. B. Fisher. 2002. mda-5: An interferon-inducible putative RNA helicase with double-stranded RNA-dependent ATPase activity and melanoma growth-suppressive properties. Proc. Natl. Acad. Sci. USA 99: 637-642. Jacobs, B. L., J. O. Langland. 1996. When two strands are better than one: the mediators and modulators of the cellular responses to double-stranded RNA. Virology 219: 339-349. Gray, T. K., G. E. Lester, R. S. Lorenc. 1979. Evidence for extra-renal 1 α-hydroxylation of 25-hydroxyvitamin D3 in pregnancy. Science 204: 1311-1313. Adams, J. S., M. A. Gacad. 1985. Characterization of 1 α-hydroxylation of vitamin D3 sterols by cultured alveolar macrophages from patients with sarcoidosis. J. Exp. Med. 161: 755-765. Reichel, H., H. P. Koeffler, R. Barbers, A. W. Norman. 1987. Regulation of 1,25-dihydroxyvitamin D3 production by cultured alveolar macrophages from normal human donors and from patients with pulmonary sarcoidosis. J. Clin. Endocrinol. Metab. 65: 1201-1209. Dusso, A. S., S. Kamimura, M. Gallieni, M. Zhong, L. Negrea, S. Shapiro, E. Slatopolsky. 1997. γ-interferon-induced resistance to 1,25-(OH)2 D3 in human monocytes and macrophages: a mechanism for the hypercalcemia of various granulomatoses. J. Clin. Endocrinol. Metab. 82: 2222-2232. Monkawa, T., T. Yoshida, M. Hayashi, T. Saruta. 2000. Identification of 25-hydroxyvitamin D3 1α-hydroxylase gene expression in macrophages. Kidney Int. 58: 559-568. Young, M. V., G. G. Schwartz, L. Wang, D. P. Jamieson, L. W. Whitlatch, J. N. Flanagan, B. L. Lokeshwar, M. F. Holick, T. C. Chen. 2004. The prostate 25-hydroxyvitamin D-1α-hydroxylase is not influenced by parathyroid hormone and calcium: implications for prostate cancer chemoprevention by vitamin D. Carcinogenesis 25: 967-971. Holick, M. F.. 2007. Vitamin D deficiency. N. Engl. J. Med. 357: 266-281. Hewison, M., F. Burke, K. N. Evans, D. A. Lammas, D. M. Sansom, P. Liu, R. L. Modlin, J. S. Adams. 2007. Extra-renal 25-hydroxyvitamin D3-1α-hydroxylase in human health and disease. J. Steroid Biochem. Mol. Biol. 103: 316-321. Kamei, Y., L. Xu, T. Heinzel, J. Torchia, R. Kurokawa, B. Gloss, S. C. Lin, R. A. Heyman, D. W. Rose, C. K. Glass, M. G. Rosenfeld. 1996. A CBP integrator complex mediates transcriptional activation and AP-1 inhibition by nuclear receptors. Cell 85: 403-414. Ahonen, M. H., L. Tenkanen, L. Teppo, M. Hakama, P. Tuohimaa. 2000. Prostate cancer risk and prediagnostic serum 25-hydroxyvitamin D levels (Finland). Cancer Causes Control 11: 847-852. Garland, C. F., F. C. Garland, E. D. Gorham, M. Lipkin, H. Newmark, S. B. Mohr, M. F. Holick. 2006. The role of vitamin D in cancer prevention. Am. J. Public Health 96: 252-261. Wu, K., D. Feskanich, C. S. Fuchs, W. C. Willett, B. W. Hollis, E. L. Giovannucci. 2007. A nested case control study of plasma 25-hydroxyvitamin D concentrations and risk of colorectal cancer. J. Natl. Cancer Inst. 99: 1120-1129. Wactawski-Wende, J., J. M. Kotchen, G. L. Anderson, A. R. Assaf, R. L. Brunner, M. J. O'Sullivan, K. L. Margolis, J. K. Ockene, L. Phillips, L. Pottern, et al 2006. Calcium plus vitamin D supplementation and the risk of colorectal cancer. N. Engl. J. Med. 354: 684-696. Garland, C. F., E. D. Gorham, S. B. Mohr, W. B. Grant, E. L. Giovannucci, M. Lipkin, H. Newmark, M. F. Holick, F. C. Garland. 2007. Vitamin D and prevention of breast cancer: pooled analysis. J. Steroid Biochem. Mol. Biol. 103: 708-711. Townsend, K., K. N. Evans, M. J. Campbell, K. W. Colston, J. S. Adams, M. Hewison. 2005. Biological actions of extra-renal 25-hydroxyvitamin D-1α-hydroxylase and implications for chemoprevention and treatment. J. Steroid Biochem. Mol. Biol. 97: 103-109. Murillo, G., D. Matusiak, R. V. Benya, R. G. Mehta. 2007. Chemopreventive efficacy of 25-hydroxyvitamin D3 in colon cancer. J. Steroid Biochem. Mol. Biol. 103: 763-767. Townsend, K., C. M. Banwell, M. Guy, K. W. Colston, J. L. Mansi, P. M. Stewart, M. J. Campbell, M. Hewison. 2005. Autocrine metabolism of vitamin D in normal and malignant breast tissue. Clin. Cancer Res. 11: 3579-3586. Hsu, J. Y., D. Feldman, J. E. McNeal, D. M. Peehl. 2001. Reduced 1α-hydroxylase activity in human prostate cancer cells correlates with decreased susceptibility to 25-hydroxyvitamin D3-induced growth inhibition. Cancer Res. 61: 2852-2856. Zhou, W., R. S. Heist, G. Liu, K. Asomaning, D. S. Neuberg, B. W. Hollis, J. C. Wain, T. J. Lynch, E. Giovannucci, L. Su, D. C. Christiani. 2007. Circulating 25-hydroxyvitamin D levels predict survival in early-stage non-small-cell lung cancer patients. J. Clin. Oncol. 25: 479-485. Porojnicu, A. C., T. E. Robsahm, A. Dahlback, J. P. Berg, D. Christiani, Ø. S. Bruland, J. Moan. 2007. Seasonal and geographical variations in lung cancer prognosis in Norway: does vitamin D from the sun play a role?. Lung Cancer 55: 263-270. Zhou, W., R. Suk, G. Liu, S. Park, D. S. Neuberg, J. C. Wain, T. J. Lynch, E. Giovannucci, D. C. Christiani. 2005. Vitamin D is associated with improved survival in early-stage non-small cell lung cancer patients. Cancer Epidemiol. Biomarkers Prev. 14: 2303-2309. Nakagawa, K., A. Kawaura, S. Kato, E. Takeda, T. Okano. 2005. 1α,25-dihydroxyvitamin D3 is a preventive factor in the metastasis of lung cancer. Carcinogenesis 26: 429-440.